In addition to its primary mission of supporting the warfighter, SuprTEK and its ADEV program recently held a fundraiser to give aid to veterans stateside. The event was the brainchild of Ken Rennie, ADEV Deputy Program Manager, and the purpose was to raise money for the Fisher House Foundation, a non-profit organization that provides housing and lodging for veterans and their families. The result of the fundraiser exceeded everyone’s expectations. The concept behind the fundraiser was simple. Team members paid one dollar per vote to elect five people on the ADEV team to receive a whipped-cream pie in the face. Team members were encouraged to vote as often as they wished for their “favorite” candidate in order to maximize the fundraising. This brought out friendly competition between team members, as the voting results jockeyed who sat atop the leaderboard. Voting surged in the last few days as team members wanted to see their preferred candidate place in the top five. As a result, the voting donations blew past the goal of $1,000 to a final tally of $2,378. The generosity did not end there, however. SuprTEK originally agreed to match ADEV’s donations up to the $1,000 goal. Yet once the team’s donations far exceeded that goal, SuprTEK decided to follow suit. 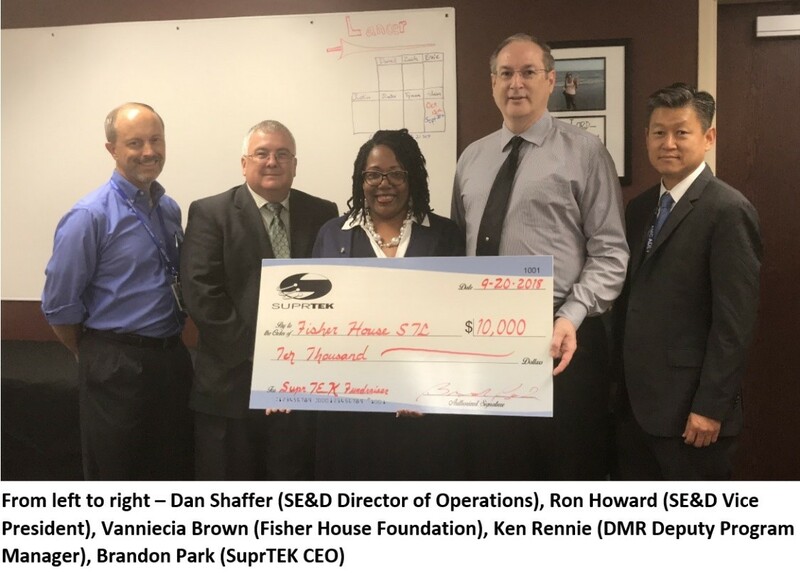 On September 20th, SuprTEK CEO Brandon Park alongside Ken Rennie, Director of Operations Dan Shaffer, and SE&D Vice President Ron Howard presented a check for $10,000 to Fisher House representative Vanniecia Brown. The money will go toward the Fisher House in the St. Louis area.